Although many IT professionals believe that using self-signed SSL certificates can help their organizations lower security costs, the real numbers tell a different story. From data center infrastructure and physical security, to the hardware and software required, to the personnel needed to manage the certificate lifecycle, the true costs of self-signed SSL security can become very expensive, very fast. 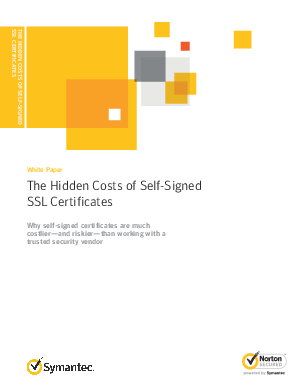 This paper explores the true total cost of ownership (TCO) for self-signed SSL certificates, including a side-by-side comparison of a self-signed architecture versus working with a third-party SSL vendor. Before a company decides to use self-signed certificates, these issues deserve careful consideration.